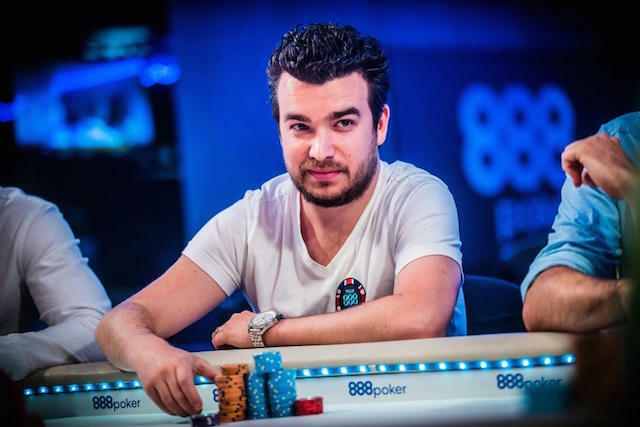 Chris Moorman didn’t become the highest all-time winning online tournament player by making mistakes. Moorman’s career is filled with accolades and he added to them by winning his first World Series of Poker bracelet this summer. Moorman is in the midst of winding down his busy 2017 and entered the Bellagio Five Diamond $10,000 High Roller event last week. “I don’t normally play high rollers, but I was playing good and it was a lower buy-in. I felt like testing myself,” Moorman said. The tournament up to that point was relatively smooth for Moorman until he found himself tangled up in a pot with Sergio Aido. Moorman had it in his mind that he was about to win a big pot but not adjusting well to an unlucky river card dashed those plans. At an eight-handed table with the blinds at 1,000-2,500 with a 2,500 big blind ante, Moorman opened off of about 300,000 to 5,500 in the hijack with . Aido three-bet to 20,000 out of the big blind and Moorman, who said he had folded previously to a few three-bets, decided to call in position. Aido continued for 17,000 on the flop and Moorman called. “I like my position to call with my over cards and the flush draw. I’m also too deep to raise,” Moorman said. Moorman’s flush came in on the and Aido fired 38,000 more. The river came the , and Moorman called the fourth heart on board “disastrous.” Aido moved all-in for 90,000 and the thoughts Moorman had of becoming a dominating chip leader were in peril. Moorman wound up making a “sigh call” and Aido showed him pocket aces with the ace of hearts. The hand took a major chunk out of Moorman’s stack and he wound up not cashing in the event. Moorman points out that in a high stakes tournament like the $10,000 event, it becomes easy to level yourself in certain situations. Among the players at Moorman’s table included Isaac Haxton and Ben Tollerene. It was paramount for Moorman to avoid being exploitable, thus making him a target for the table filled with elite talent. The worst river card hit for Moorman and his dreams of winning a substantial pot were dashed. Moorman says he got ahead of himself during the hand and struggled to establish himself within the new reality of the fourth heart on board. The river call was made not out of pure poker sense, but out a little bit of frustration as well. Even a well-seasoned pro like Moorman is capable of suffering from a lapse in judgment. Moorman suggests players try as much as they can to remove the emotion of the situation itself from the decision making process. When confronted with the frustration of the moment, Moorman texted a few folks to get the hand off his chest and recommends that source of conflict resolution to others. This hand, as thousands before it, will serve as a lesson for Moorman and he will put his skills to the test again next week in the WPT Bellagio Five Diamond World Poker Classic Main Event.